SMS alerts are a one-way communication, whereas Chatbots are interactive and enable two way conversations through ‘Smart Alerts’. Smart Alerts improve travel experiences and bridge inter-staff communications. 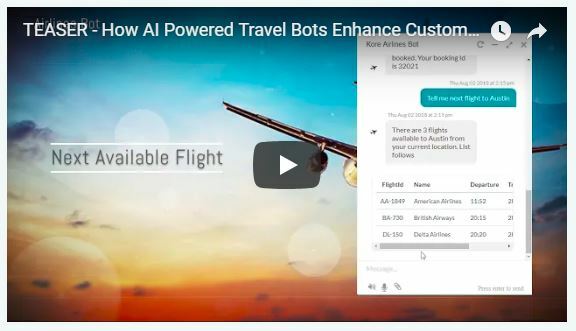 For example, KLM Royal Dutch & Emirates Airlines experienced a massive surge of traffic after they launched chatbots that helped passengers with timely alerts. 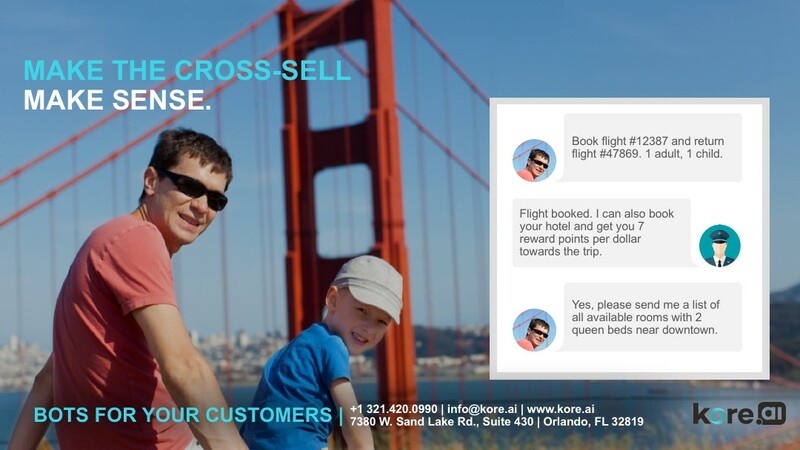 Kore.ai introduced ‘Smart Alerts’ in its chatbots that help customers and employees receive timely notifications on their travel transactions and improve communications with airlines staff and systems. 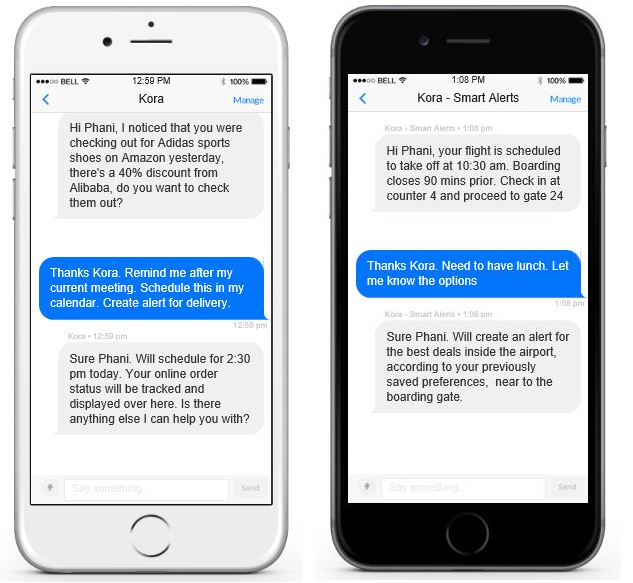 ‘Smart Alerts’ from Kore.ai chatbots inspire conversations — through Natural Language Processing (NLP) — to make the customer experience easier, faster and more satisfying. Kore.ai chatbots have access to available knowledge about the customer and how similar customers responded. With data collection gaining significance, the places where humans can match the ability of machines to make real-time decisions will be precious few. Solutions to help lines of business (such as sales and marketing departments) to improve decision making are also popular. On an average, commercial airlines employ 8.7 million people and support an additional 50 million workers in offices and airports around the globe, and they move three million passengers per day over 100,000 flights. This does not include the millions of packages and cargo transported on commercial and non-commercial planes. Problems arise every day, from small mechanical issues to flight cancellations due to bad weather conditions, mixed-up reservations to lost luggage and packages and so on. Regardless of all these adverse situations, airline staff have the responsibility to communicate with each other to make the best of all situations and delight their customers. Communicating with airlines personnel throughout the network is time consuming and challenging. Human agents are not as good at sifting through data quickly. In such a scenario, a chatbot can play an important role by promptly looking at a passenger’s travel record and determine whether the customer always flies business or economy class, travels with kids, or prefers more leg room - and send alerts accordingly to the passenger to avoid further delays. The variety of job functions in airlines industry also impact the effectiveness of communication to disparate workers. Not every airline staff sits behind a personal computer. Many workers aren’t even connected to any device, while others use a Terminal to execute their business. Most often, email is not an universal tool of communication for airlines. Through mergers and legacy systems, many airlines have multiple email platforms creating barriers to effective communication. Whereas, employees are mostly used to social, connected hand-held mobile tools in their personal lives and desire the ability to communicate and collaborate whenever and wherever they choose. 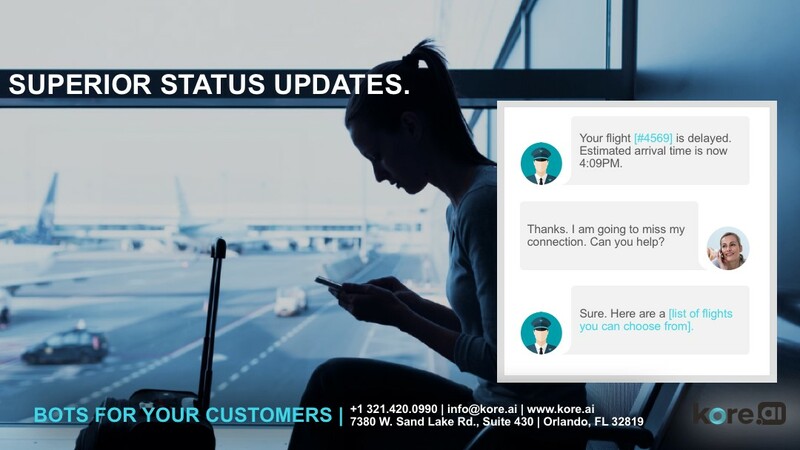 Kore.ai’s new ‘Smart Alerts’ lets the airlines send contextually relevant information to users during their bot dialog journey. Depending on the context and trigger, you can manage and terminate notifications that may be of interest to users. It can give customers personalized and timely notifications that make sense to them. Kore.ai bots will never let you forget about your next boarding time. With an integrated reminder feature, users are kept up to date with their flights and unexpected changes. The feature also allows passengers to set their own alarms with a quick reminder text. This is specifically useful for passengers that tend to get caught up in the terminal shops. The alert can be set right in time for someone to walk over to the gate after spending a couple of minutes shopping through the duty free section. This feature is definitely not the most important one, but it helps expand the usability of the bot which adds to the user experience. For a better understanding, take the example of the chatbot used by KLM Royal Dutch Airlines - which sends flight information, check-in notifications, boarding passes, and flight status updates. For complicated questions, passengers are seamlessly connected with a human agent. Travelers can get alerts on best seating lounges, flexible flight timings, recommendations on cheapest destinations from the user’s nearest airport. Chatbots helps the teams communicate via alerts regarding the passenger information, flight status, onboarding clearance, document clearance, flight check information - in terms of simple texts. Implementing a Kore.ai bot with a customer support and marketing strategy can help enhance overall customer experience and brand equity. Marketing managers are trying to find solutions to help their teams become more effective on social media platforms, while Customer Support Managers are trying to find solutions to help their customers feel supported immediately. The noise around bots is very real for companies that face high volumes of customer inquiries. Airlines manage their traffic round the clock and each flight brings another potential customer who needs to be supported conveniently. — At best with a Facebook bot! - Check on ways to integrate Kore.ai chatbot into the Facebook messenger. John Chambers, former CEO of Cisco, was quoted as saying, "More than one-third of businesses today will not survive the next 10 years. Companies should not miss the market transition or business model nor underestimate your competitor of the future — not your competitor of the past." If you want to use Kore.ai's technology to integrate AI-rich chatbots into your company's software and enterprise business solutions, click on the Button below to Request a Demo.